Georgia: Are the Police Backsliding? The reform of Georgia’s law-enforcement apparatus was once the pride of the country and still serves as a model for the rest of the former Soviet space. But a series of high-profile incidents of alleged police misconduct have highlighted concerns that progress is stalling and public mistrust of the police is growing. Two of the most recent controversies were the arrest in early June of a rap duo, collectively known as Birzha Mafia, on questionable drug-possession charges and the scandalous abduction, in May, of Azerbaijani journalist Afgan Mukhtarli. But even before these incidents, opinion polls were showing a decline in public confidence in the law-enforcement system. According to surveys, 60 percent of Georgians approved of the police’s performance in November 2013, but that number had dipped to 38 percent by April of this year. 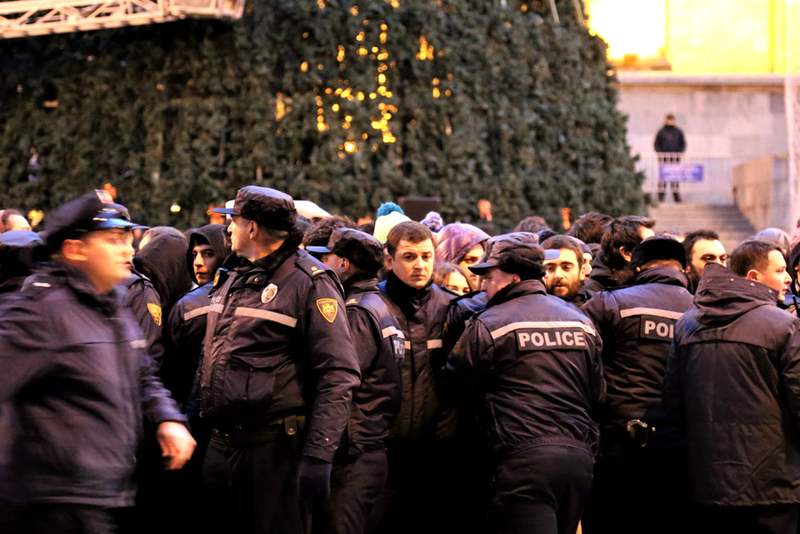 Over the same period, the share of those dissatisfied with the police rose from single digits up to 14 percent, according to a survey conducted by the National Democratic Institute and the Caucasus Research Resource Centers (CRRC). “The trend is clear: Georgians are less impressed with performance of their police force today than in years past,” said Dustin Gilbreath, a policy analyst with the CRRC. The detention of the rappers is likely to exacerbate that trend. One of the arrested rappers, Mikheil Mgaloblishvili, claimed that police planted ecstasy pills on them in retaliation for portraying a policeman on a leash in one of the duo’s online videos. “Dog” is a derogatory term for police officer in Georgian, but the use of it has declined markedly amid last decade’s sweeping police overhaul, in which thousands of officers were dismissed and replaced with new recruits, salaries were increased, and police agencies were reorganized. Those reforms largely succeeded in replacing the long-standing image of a big-bellied, venal cop with that of a young, carefully trained officer in a crisp uniform. The Birzha Mafia case sparked a protest march on June 10 – the largest that Tbilisi has seen in several years. Among the protesters, there was no doubt that the police had planted drugs on the young rappers. “I am far from assuming that every single time [there is a drug arrest] that police are planting drugs on suspects, but we’ve seen so many violations of due process that the public automatically distrusts these sorts of cases,” said Eka Gigauri, the director of the Georgian chapter of corruption watchdog Transparency International. The Birzha Mafia incident harkens back to the 1990s, when there was a strong animus between police and young people. In those days, police were the scourge of the birzha, a Georgian term for a group of kids hanging out in the street. Even merely looking scrawny and gaunt, as this correspondent can attest, was sufficient probable cause to get frisked for drugs, or even dragged to a police station. A luckier teenager would have an influential relative or family friend call to get the police off his back; the less fortunate would get detained, have all sorts of misdemeanors pinned on him and then have to bribe his way out. Two decades and a lot of reform later, Georgia is a different place and bribery is no longer a major issue. But questions remain about police practices, especially in the controversial war on drugs, and an overreliance on secretive methods of surveillance, which gives political officials potential access to compromising material on their rivals. A Tbilisi court eventually released the two rappers on bail briefly after Georgia’s rapper-in-chief Bera, the son of the nation’s richest man and rumored power-behind-the-scenes, Bidzina Ivanishvili, weighed in the case, writing “I stand by you guys” on Facebook. That did nothing to dispel the sense that the rich and the powerful have VIP access to Georgia’s justice system. Georgia’s authorities also have failed to shed light on what happened to dissident Azerbaijani reporter Afgan Mukhtarli, who more than a month ago was abducted on a downtown Tbilisi street in broad daylight and turned up in a Baku jail shortly thereafter. The incident caused a torrent of criticism of the Georgian police, including questions about whether Georgian law-enforcement officers were somehow complicit. That followed an incident last year when police failed to stop, and then to effectively prosecute, an assault on politicians from the opposition United National Movement (UNM) at a campaign event, contributing to the impression that the law-and-order system is influenced by political affiliations. The governing Georgian Dream party’s response was essentially to remind Georgians of how the UNM, in its own time in power, also used the police as a tool to suppress opposition. The fundamental problem, analysts say, is that the police remain subject to political influence. “The realization that your career depends not on achievements in the line of duty, but rather on loyalty to whoever is in power, has a corrupting effect,” said Transparency International’s Gigauri. Devdariani, who worked on police reform in Serbia between 2006 and 2011, recommended several systemic reforms that would disentangle police from politics in Georgia. “It’s not rocket science,” he said. One reform would be to reorganize the chain of command, so that there is no direct linkage between the interior minister, a political appointee, and the uniformed police. Another would be to appoint an independent police chief for a term longer than that of the government, which would help ensure that his or her position does not depend on remaining in the governing party’s favor. In addition, the interior minister should not be able to dismiss the police chief unless the chief is accused of a crime, or an egregious ethical or procedural lapse, Devdariani said, adding that the police should also switch to a preventative policing model. Gigauri said creating a truly independent system of police oversight should be a top policy priority. As long as the police serve to protect the party in power, law enforcement agencies and the political establishment will continue the pattern of closing ranks when faced with accusations of misconduct, she said.